LATEST on Senussi and Mauritania (Aug 6 2010): Mauritania’s President has ruled out extraditing Abdullah al-Senussi before he is tried there for illegal entry and use of forged documents. (His passport) “presents him as Malian and under a fake name, which is why he must undergo trial in Mauritania,” Abdel Aziz said. I hope he’s not sitting in some white-collar jail with air-conditioning and full gym – or under house arrest in a luxury villa. Note: No news really on where Senussi would be extradited to stand trial. Libyan Prime Minister Abdel Rahim al-Kib went to Nouakchott to press for extradition to Libya, but the ICC also wants Senussi in the Hague to stand trial on a war crimes warrant. France wants him too in connection with a UTA airliner bombing that killed 170 people, most with ties to France. See full article at Libyan Tweepforum. Muammar Gaddafi’s right hand man, head of Libyan intelligence and brother-in-law, Abdullah Al-Senussi, has finally been nabbed. The Mauritanian authorities reportedly arrested him inÂ Nouakchott airport when he arrived on a flight from Casablanca, Morocco. The skivvy is that the French and Mauritania government worked together on the sting. Responsible for the detention and death of thousands of Libyans, al-Senussi should known where a lot of bodies are buried – literally. Hundreds of Libyans are still unaccounted for. Other questions that need answering: Where has he been since the fall of the Gaddafi regime? Who has been aiding him? And, most important, what kind of plans was he scheming to continue the counter-revolution? There’s still no news on his extradition to Libya. Al-Senussi is wanted not only by Libya, but also by France and the ICC. Al-Senussi was sentenced in absentia for the 1989 bombing of a UTA airliner which killed 170 people. Families of the victims have demanded Â justice in France. 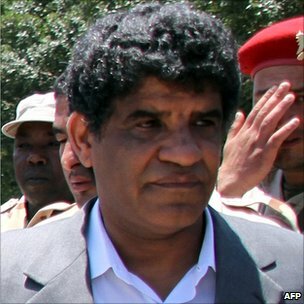 Senussi is one of the three Libyans wanted by the ICC for war crimes. The other two were Muamar Gaddafi, killed in Sirte, and eldest son and heir apparent, Saif al-Islam Gaddfi Â being held in Zintan. Mauritania is not a signatory to the Rome Statute governing the ICC, so is not obligated to enforce the warrant. Â Libya’s government spokesman confirms it is also seeking Senussi’s extradition.Â Senussi is suspected of a key role in the deathsÂ in 1996Â of 1,200 prisoners at Tripoli’s dreaded Abu Salim prison . The arrest of a lawyer for victims’ relatives ignited Libya’s revolt in February 2011. The next few days should reveal more about who’s going to get their hands on this last key figure of the Gaddafi regime – Libya, France or the ICC in the Hague.